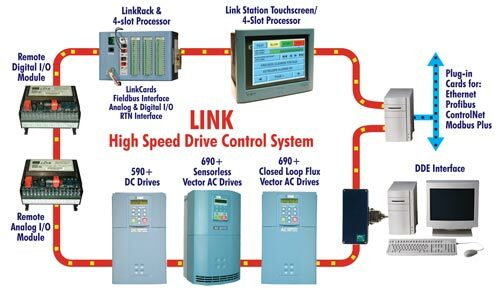 The Integrator series is a single family of AC (690+) and DC (590+) drives offering the benefit of common programming, a selection of Fieldbus communication options and software tools across both technologies. The 690+ AC series is user configurable for basic open-loop (v/Hz), sensorless vector or full closed-loop, flux vector control. The 590+ series is available in DRV format incorporating all fuses, AC supply contactor, and optional fan blower starter and control transformer within the same footprint area. 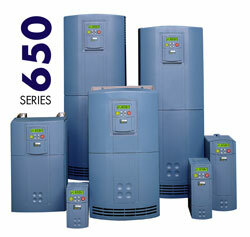 The 650 series inverters provide simple, no-fuss speed control of standard three-phase AC motors from 0.3 to 150 Hp. Sensorless vector versions (standard above 10 Hp) provide exceptional dynamic response. They are full of useful features including pre-programmed applications - all designed to simplify set-up, installation and operation. The Integrator Series is a single family of both AC drives (690+) and DC drives (590+) that provides the benefits of common programming, set-up and communications across both technologies. 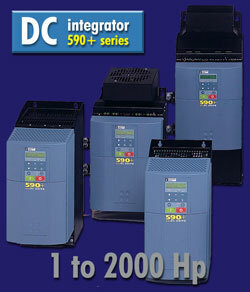 The 590+ Integrator series highly advanced DC drive meets the demands of the most complex motor control applications.